As the country’s expat population grows, so has the number of naturalized Koreans and foreign residents rising to prominence in various fields. However, none have risen quite as high or as fast within Korean society as Rep. Jasmine Lee of the ruling Saenuri Party. Lee, who is originally from the Philippines, became a naturalized citizen in 1998, three years after she married her late husband Lee Dong-ho. Since then, Lee has held a variety jobs ranging from television presenter and film actress to civil activist. In 2011, she became the first naturalized Korean to be employed by the Seoul metropolitan government as a civil servant. In the following year, she was voted into the National Assembly as a proportional representative of the Saenuri Party, becoming the first non-ethnic Korean to become a legislator. Despite her varied career, however, the theme of promoting multiculturalism has been a constant for Lee in her time in Korea. “When I was working for a nongovernmental organization, I always thought there was more I could do if I went up the ladder. I was given the chance last year, and I took it,” Lee said. 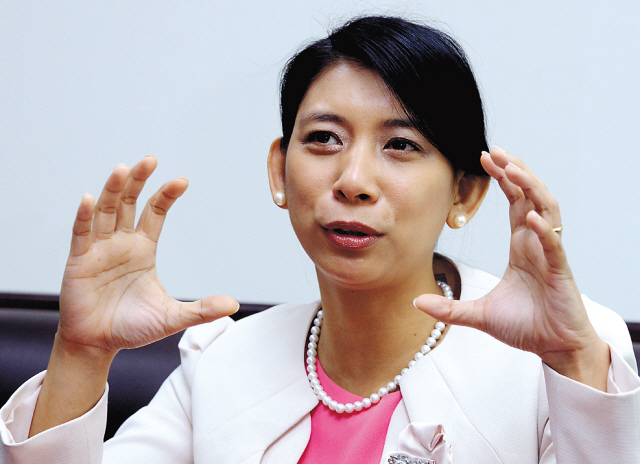 While the first-term lawmaker and other high-profile immigrants such as Korea Tourism Organization chief Lee Charm are far from the norm, Lee says that changes that indicate the rising status of foreigners in Korean society are taking place across the country. “Me sitting right here, right now will tell you that things are changing,” she said. Lee added that the level of Korean language proficiency is a big factor in enabling expats to play bigger roles in their communities and to rise to more prominent positions in society. While Lee says that she is only doing what she can to make the changes she has always wanted to bring about, being a legislator has changed her views in some ways. “Before, I wanted to actually get rid of the word ‘multicultural’ because it has a negative impression on people,” she said, noting that many Koreans have preconceptions about terms such as “multicultural” and “multicultural families” as referring to Southeast Asians in underprivileged conditions in Korea. However, Lee also says that despite its uses, the term “multicultural” is also integral to the stereotypes and preconceptions Koreans have about immigrants ― an aspect of Korea’s brand of multiculturalism that the media plays a large role in. She pointed out that news organizations rarely highlight the lives of happy, well-functioning multicultural families, choosing instead to focus on social problems that arise from such families. “I’ve worked in the media and I know how they affect and how big an impact it makes, because I’ve been there for seven years,” she said. She added that because of this she wanted to become a member of the parliamentary committee dealing with culture and broadcasting issues in the early days of her term. She went on to say that many Koreans’ limited experience with foreigners leads to stereotypes and biases. However, she says that prejudice towards marriage immigrants in Korea seems to be related more to social status than race. In addition to the widespread prejudice against immigrants held by the public, Lee pointed out that the authorities need to coordinate multicultural policies for more efficiency, and to approach related issues from a more fundamental, long-term angle. “No government agency is concentrating on defining multiculturalism in Korea, or at changing the negative perception that is actually growing in society,” she said. She added that current policies bring short-term measures that are like “first-aid bandages” that will soon lose their efficacy. Such long-term efforts, Lee says, should begin by defining what multiculturalism means in Korea, and by accepting immigrants as being part of Korean society as a whole, rather than perceiving them as belonging to a separate group. “The multicultural society of Korea is all 50 million of us. You can’t say that they (foreign nationals) are part of the multicultural society and that we (ethnic Koreans) are of Korean society. It does not work that way,” Lee said.